As of November 16th the game remained available to download and play for free on Steam and Xbox One but the PlayStation 4 version in North America (US and Canada) was unavailable from the web or the console. It was still accessible from other territories including Australia, Europe, France, and Germany on that day but by November 23rd the game had been removed from these territories as well. On November 22nd Massively Overpowered reported word from an anonymous source that Gazillion Entertainment had disbanded, laid off nearly all staff, and would be shutting down the game on November 24th instead of December 31st. The source also shared parts of a termination letter delivered to Gazillion staff by CEO Dave Dohrmann that indicated creditors had “pulled the plug” on funding, and that accrued time off and health benefits were no longer being honored. Throughout the day, tweets from now-former Gazillion staff confirmed many of these details. The game’s subreddit group tallied the losses throughout the day which ended when the game’s homepage and forums were ultimately taken down. Massively Overpowered provided a succinct recap of the events surrounding the game’s development and final months. Even still, It is hard to define if the overdue content updates, dormant social media accounts, and departed staff members are solely due to the allegations of misconduct or if the game’s development had already been suffering before the ethical concerns came to light. According to former Gazillion employee, Anthony Gallegos, who spoke on Kinda Funny Games Daily on November 27th, Gazillion’s contract with Marvel was lost at some point in October, resulting in a halt in development on the game. Employees were furloughed from working on the game (and interacting with the community through Gazillion’s official channels) a few weeks before they were terminated. Despite the accusations of inappropriate conduct by the studio’s leadership, Disney/Marvel’s decision to shut down the game may have been based on the dwindling player count. According to Steam player data the number of active players dropped precipitously through 2017 with less than 1,000 daily players for the latter half of the year. Gallegos pointed out that the console versions of the game were intended to be a new revenue stream for the studio but that profits never hit the intended target. Furthermore, Disney/Marvel may have already planned to shutter the game to further align with their larger direction for the Marvel universe across all forms of media. 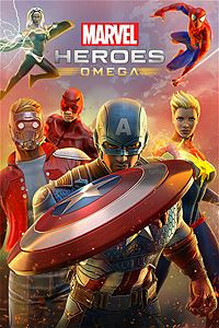 “Marvel Heroes Omega assembles one of the largest gatherings of iconic Super Heroes, Super Villains, and locations from the Marvel Universe in gaming history for PlayStation 4, Xbox One, PC, and Mac. Set in the iconic Marvel Universe, Marvel Heroes Omega combines the core game-play style of Action RPGs and MMOs with the expansive library of heroes from the Marvel Universe. In the game, players can collect and play as their favorite Marvel Super Heroes (including Iron Man, Thor, Wolverine, Hulk, Spider-Man, Captain America and many others). Play as Iron Man, Thor, Wolverine, Hulk, Spider-Man, Captain America, Deadpool, Emma Frost and many other famous heroes. All Heroes fully playable to level 10. Earn additional heroes for free just by playing the game! Join with your friends and other likeminded adventurers in one of Marvel Heroes Omega’s many Headquarters, including Avengers Tower and the S.H.I.E.L.D. Helicarrier.